TEMPE – With starting quarterback Carson Palmer still out with a shoulder problem, the Arizona Cardinals are relying on surprising players beyond backup Drew Stanton to seal wins. Rookie wide receiver John Brown is turning heads three games into his NFL career. The 5-foot-11, 179-pound receiver already has three touchdowns for the team, two of which have been for go-ahead scores. Brown was a third-round draft pick of NCAA Division II Pittsburg State, a Kansas school with an enrollment of just over 7,400. But coach Bruce Arians said Brown isn’t a typical rookie. It’s not just the speed of the game Brown has learned quickly but also all the information that’s been thrown at him, Arians said. “He’s handled it extremely well,” he said. Brown had two touchdowns in 23-14 win Sunday over the San Francisco 49ers that has the Cardinals 3-0 going into their bye week. After the Cardinals got off to a slow start on offense, Stanton connected with Brown early in the third quarter for a 24-yard touchdown, Arizona’s first of the day, to close to 14-13. A few minutes later, Brown split two defenders to catch a 21-yard touchdown strike from Stanton and put the Cardinals on top 20-14. On the day, Brown had receptions for 52 yards, giving him 109 yards for the season. Arians said Brown is acclimating well but still gets caught up in the excitement like any new player. 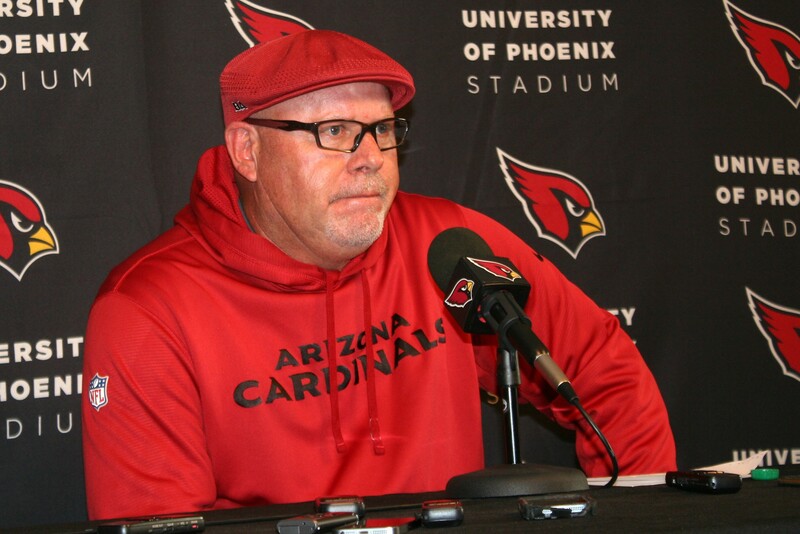 Even though Brown makes small mistakes, Arians said he doesn’t see a limit to Brown’s potential. “He’s just scratching the surface,” he said. Stanton practiced with Brown in camp, and their chemistry showed in the game, when both of Brown’s touchdowns came on the same play. 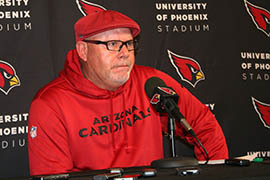 With known receivers like Larry Fitzgerald and Michael Floyd sharing the field with Brown, Arians said he’s confident in his offensive team. Even though the rookie’s name isn’t as well-known as his counterparts’, Arians said he’s gotten the attention of the other teams already. Arizona Cardinals coach Bruce Arians said rookie receiver John Brown has learned his system quickly.